Deciding which skill sets to add to your resume as you adapt it to various positions can be difficult. Do potential employers care about the many volunteer programs you have been a part of, or are they more interested in the numerous minor achievement awards that have been bestowed upon you? One thing is certain; no matter what career you are applying for employers are intent about seeing what IT skills you can bring to the table. The idea might be somewhat surprising, but nearly every career-level position out there today requires some level of technical knowledge. The more you have, the more likely finding a job will be a breeze. Here are just a few positions that value IT skills more than you would think. Careers in the healthcare industry have sincere need for professionals with IT skills and capacities. Many major technological advances in the field have been slow to take effect because of the necessary time to retrain busy doctors and nurses that have been practicing for years. As these individuals reach retirement age and new positions open up, hiring managers are looking to hire people who are versed in current hospital tech, and are willing to take on new technical challenges as they arise. And they are sure to arise; new technology is being implemented in healthcare every day to help doctors better understand their patients. For instance, researchers in University of Cincinnati’s Health Informatics program tested the advantages of implementing geographic information systems into medical research. They found the technology to be promising, but concluded that many facilities did not have the capacity to take advantage of it at this time, but likely would begin implementing it in the near future. When thinking of places where IT skills are highly valued, libraries may be one of the last places to come to mind. In reality though, librarians have adapted to the age of technology. They are often some of the most well-versed individuals in finding valuable research information through technical avenues and can be a massive asset in any project. In fact, in many places it can be difficult to acquire a position at the local library without a considerable IT skill set. Librarians are expected to be able to help visitors from all over the world navigate their e-library, where many books in the collection have been scanned into the system and can be ‘checked out’ online. Librarians are often now considered the managers of massive databases of information. Perhaps even more surprising than the need for IT skills in library positions, is the need for IT skills in career-level construction positions. Although a great deal of the work within the field is still very hands-on, computers have made a major impact on the industry. Computer-based programs have allowed for far greater accuracy in field and greater communication with architects and engineers off-site. Because of this, many site managers must be proficient in the use of these programs to direct employees and complete their job. For many large projects, the use of computers for analysis of work processes has enabled contractors to both promote workplace safety and reduce the overall budget. Furthermore, the technology has allowed for greater project collaboration, which can keep everyone from plumbers to electricians on the same page. The addition of IT skills to your resume is a huge advantage no matter the position you are applying for. Even in the most unlikely careers, this type of experience makes for a significant bonus to hiring managers. 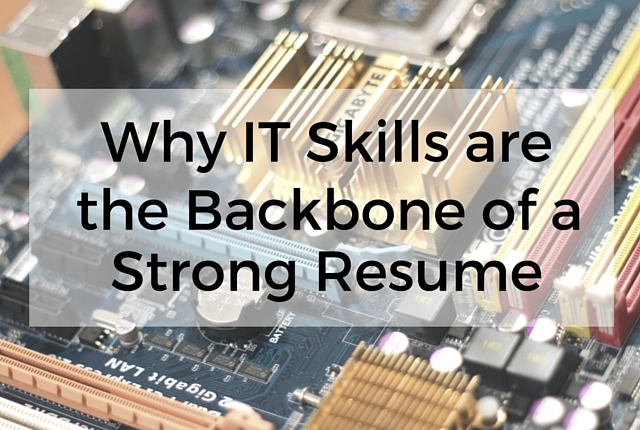 Clearly, IT skills have become the backbone of any strong resume out there today. About the Author: Brittni Brown is a current Masters student at the University of Idaho. In her free time she enjoys a variety of outdoor activities including hiking, biking, and rafting.